Bengaluru, Sep 07 2017 : Amid a political slugfest over the killing of journalist-activist Gauri Lankesh, her family today made a plea against giving political colour to it, even as her kin appeared divided on who should probe the brutal killing that has sparked a nationwide outrage. The family also said the investigators should look into all angles behind Gauri’s killing, whether it is right wing or Naxals, as reports have emerged about possible Naxal hand, other than suspected involvement of right wing extremists, the ideology that Gauri had opposed throughout her life. "I request, please don’t give political colour to Gauri’s killings, please give justice to a journalist, a woman and to our sister," Gauri’s brother Indrajit Lankesh, flanked by his sister Kavitha Lankesh, told reporters here. Asked about Rahul Gandhi’s attack on Prime Minister Narendra Modi, BJP and the RSS in connection with the killing, he said he did not want to comment on it. "What we want is justice and please don’t add political colour to it, add ideological colour if you want, because she stood for her ideologies," he said. "Please don’t take advantage by giving political colour to it. What I want to tell politicians, whichever party they are from, please don’t colour this with political angle." 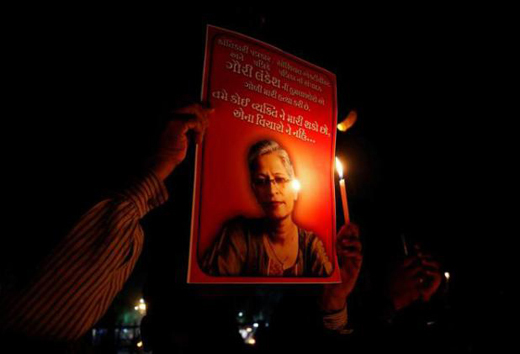 In an audacious attack, 55-year old Gauri, known as an anti-establishment voice with acrid anti-right wing views, was shot dead at close range by unknown assailants at her home here on September 5. Gauri, a writer, publisher and editor, had returned home in her car and was opening the gate when motorcycle-borne assailants sprayed bullets with two hitting her in the chest and one on her forehead, police officials had said. As the Special Investigation Team (SIT) constituted by Karnataka government today began its probe into the killing, there seemed to be differences within the family about whether the case should be handed over to CBI for probe. While Indrajit favoured a CBI probe, Kavitha said the SIT which is currently investigating should be given time. Indrajit said, "We don’t know how far it will go, but the family has decided let this (SIT) be there for now. Personally as a journalist what I request is if we don’t get justice, I will give memorandum to CBI or retired judge (for inquiry), because we want justice", he said. "Gauri’s murder should not become one among several such cases, it should become a landmark, so that no one indulges in such crime in the future to silence a voice or an ideology or the firebrand journalism that she practised," he added. Asked whether they will ask for a CBI probe only after the SIT fails to do justice or immediately demand for a probe by the central agency, Kavitha said, "It has become a fashion I think to say CBI, CBI." Immediately intervening, Indrajit said, "According to me it’s not a fashion, nor do have I complete confidence. The family will completely cooperate with the SIT. If we don’t get justice, I personally - I have not spoken to my sister (Kavitha) or mother about it - I will go to CBI." When reporters specifically asked both of them for clarity as to how much time they would give to the SIT before going to the CBI independently, Indrajit said, "What we want is justice for our sister and family." He said, "At the end of it, it is not about going to CBI or special judge or SIT, it is about getting justice, for that I’m ready to do anything and my family also are there with me. We are all together to get justice for our sister." He said whether it is Naxals or right wing extremists behind the killing, the entire journalist fraternity needs an answer, as a journalist who stood for her values has been killed. With reports about the Naxal angle to Gauri’s killing coming into picture, the family requested the investigating team to look into all aspects. He also said Gauri had no personal enmity towards anyone. Asked whether the family believes that her fearless journalism and open expression of the ideology that she believed in was the reason for her killing, Kavitha said, "Yes, according to me that is the main reason." Indrajit said Gauri had only ideological enemies, no personal enemies and she was even cordial with her ideological opponents. "Every angle has to be probed whether it is right wing extremists or Naxalites... it has to be probed," he said, adding that because "she was rehabilitating them (Naxals)...if there was any differences, it has to be probed." In response to a question, pointing out that Gauri on Sunday had told their mother about some one suspiciously lurking near her house, Kavitha said, "Any one person walking around suspiciously, you can’t complain about it. Any other person who is less brave would have probably complained and got security, but she (Gauri) is - what you call brave, also foolishly brave maybe." Justice in Gowri Lankesh case is must , as this is the work of some sharper shooter who may be hired for this.